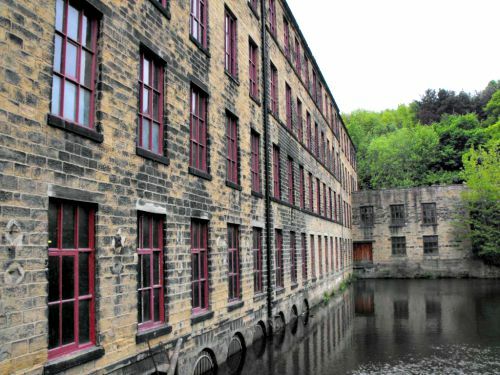 The Current grade 2 listed building that is Armley mills was built in 1805 by Benjamin Gott, who was one of the countries leading figures in the industrial revolution. There has been a mill on the site long before Gott first built the current structure, with records showing a mill in operation on the site during the mid 1500's. When Gott bought the property the mill that was in place was a sever fire hazard, with dangerously outdated equipment and cloth fibres in the air, Gott decided to start fresh and whether it was an accident or not, soon after Gott obtained the property it burnt to the ground. When it first opened the mill was the largest woollen works in the world and became the largest single employer in the area, though this would all end in 1971 when the mill finally closed its doors as an operating mill for the last time. The building was set up to use water power and was fitted out with very old machinery, and becoming a victim to modern technology the business was forced to close down. It was sold the same year to Leeds city council who left it as it was until 1982, when it was made safe and opened to the public as a museum which it remains as to this day. One thing about these old woollen mills is that they were typically quite dangerous places to work. If you ever have the chance to tour one of these types of buildings its definitely worth a look to see all of the huge, scary looking equipment, such as the wool puller which was a set of metal spiked rollers which would pull inside clumps of wool to be twisted into fibres. This old equipment had absolutely no safety features at all, and if you got caught in a machine it was simply a chance of who was close enough to do something about it before it was to late. As for paranormal activity in the building it is all thought to be caused by past employees who met their end while working here. When the mill first opened there was no age limit on who could work here, and many young children would often be doing the same jobs as the adults. This would possibly explain why so many people have claimed to have witnessed the spirits of several young boys, or possibly the same one who is rather active. The sounds of crying from what seem to be from a young boy have been heard within the upper machinery room, along with small shadowy figures which seem to slip out of view as soon as you lay eyes on them. The mill is also home to what can only be described as a Poltergeist, with reports from visitors and staff alike about being touched, sometimes forcibly shoved by unseen hands, though they haven't actually injured anyone yet. This activity doesn't seem to be caused by one spirit, as some of the activity is quite negative, such as the shoving or throwing objects across rooms, but rather by a group of spirits. People in tour groups often claim to feel pulling at the bottom of their coats, as if a small child were trying to get their attention. Apart from this there's a few other claims which seem to be spread all throughout the building, with another of the most commonly encountered ghosts being that of a woman dressed all in black, who is believed to be looking for her child who died working at the mill.